The day I came across this poem by Thomas Hood in an anthology, it gave me a strange feeling – as if a voice was speaking to me from the past. I knew I’d heard those lines somewhere before, but couldn’t quite place them. Perhaps it was something we’d had to learn at school and read out in morning assembly? Or maybe it was in one of the children’s poetry collections we were given for Christmas? But after a while I began to hear the voice of my father, reciting the poem in that slightly hammy way of his which always made us laugh. The words were faint at first, but grew louder in my head until I could hear his South London accent almost as though he were in the room. Yet however hard I tried, I could only ever hear him saying the first three lines over and over again. As a child I’d presumed he’d made the poem up himself, just as he often came out with his own jokey rhymes to amuse us. Then I realised that most likely he had been the one who’d studied it at school, and the memory had stayed with him since (as is often the case with poetry rote-learned when young). And it was obvious that as an adult he would have realised the final lines of the first verse might have sounded rather macabre to children growing up in times when death in childhood was not a common occurrence. The poem started me thinking about the places where we are born. I knew from my father’s birth certificate that (despite him once fancifully telling my mother he was from Blackheath for some inexplicable reason), that he’d taken his first breath in a crumbling mid-Victorian terraced house in Brixton. A house which had neither electricity nor an indoor toilet. A house that had afforded him a view of the Crystal Palace burning down in 1936 from the upstairs bedroom. A house which, when my grandfather had the chance to buy the freehold for around £100 in 1938, was condemned out of hand by his brother Arthur (a ‘builder’, of whom my grandmother was rather suspicious). I knew those details because my aunt – who’d also been born in the house – had written to tell me all this when she first discovered I’d been delving into the family history. Her letter, which contained snippets of intriguing information about the family, ended with the ominous words . . . the war seemed to be the beginning of time – what happened before was rather like a dream. So my grandparents never owned a house (the war put paid to that, amongst other things), and were of the generation that saw nothing unusual in this. But it was probably just as well my grandfather did not risk buying 95 Denmark Road as the street was eventually badly bombed in an air raid, and today the road is mostly home to post-war housing association blocks. 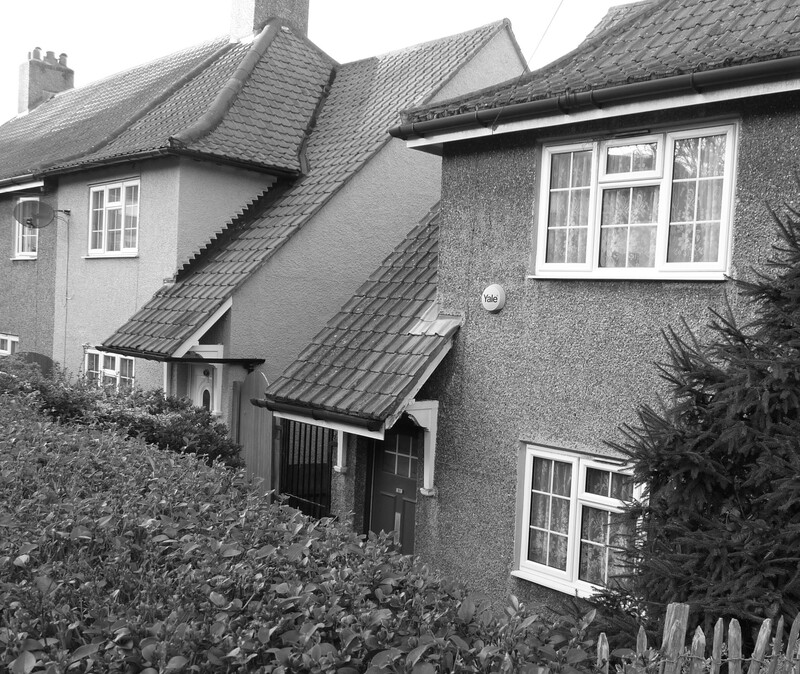 However, by the time the Luftwaffe were preparing for their assault on London, the family had already been allocated a semi in Durning Road on the Bloomfield Estate – a 1920s cottage-style garden development near to Gypsy Hill, built on the site of the former Bloomfield Hall. Over seventy years later, my aunt could still remember the move with affection: It was like paradise. We had electric lights! We had a bathroom! And wonder of wonders we had a through way from the front garden to the back garden, and we all loved it. But perhaps I am getting ahead of myself here, for our story starts in Fulham in another terraced house where my grandmother, Edith Stops, and her two older brothers were born in the 1890s, and where to all accounts the family had led an untroubled life, and one typical of late Victorian artisans. My grandmother’s father, Thomas Stops, was a blacksmith and wheelwright. His father, William (also a wheelwright), had come to London from Wendover in Buckinghamshire and had settled in the Hackney area, siring a family of seven children, six of whom were male. Thomas, one of the middle sons, married Harriet Burnell in Wandsworth in 1887 at the age of thirty-four. Harriet, who was originally from Somerset, had left school at the age of twelve to take up a position as a domestic servant in her native Highbridge, and had eventually moved to London: the 1881 census showed that she worked for a corn merchant and his young family in Camberwell (although if typical of the period, she most likely moved employers several times). Thomas and Harriett were both in their thirties when they married, perhaps marrying later for financial reasons in a bid to rid themselves of the poverty into which they’d been born, and they settled into their two-storied house on part of a new estate of Victorian terraces off the Wandswoth Road, in Fulham, raising three children after a six year hiatus which was no doubt unplanned and unexpected! According to Charles Booth, who was prowling around the area at about this same time creating his poverty maps: The main feature of Fulham is its newness. Twenty years ago it hardly existed. There is still a fair amount of open space in the form of market gardens at the western extremity and private houses and grounds at the southern extremity, but each year both are eaten into by the builder with amazing avidity. He went on to say: The new tenants come from every part of London, especially from south-west London, drawn hither by the fact that there are houses to be had and that they are suited to their needs. By ‘their needs’, I am assuming he is referring to the affordable rents, and the fact that the area was regarded as a reasonably respectable part of town, although he does go on to mention that as regards proximity to work, Fulham is at a disadvantage for it is hardly possible to be in London and further away from the City. For Thomas Stops this wasn’t a problem, as he worked locally as a coachman and blacksmith. However, in 1906, this family idyll came to an abrupt end when Thomas’s life was cut short through contracting tuberculosis in his early fifties, leaving the widowed Harriet with three children to care for. The family had already moved to Denmark Road by this point, and Thomas died in the nearby Lambeth workhouse infirmary. Despite the grim-sounding name, attending the hospital which was attached to the local workhouse was relatively common in those pre-NHS days, and simply meant the patients did not have the means to pay for private healthcare. Nevertheless, it is also likely that the family had fallen on hard times, which had perhaps precipitated their move to Lambeth in the first place. Thomas’s failing health may have been the cause of this, and is a salient reminder of how insecure life was for even the ‘respectable’ working classes at that time. After her husband’s death, Harriet took in boarders to help pay the rent, as many other householders did at that time. She was to remain at 95 Denmark Road, later sharing her house with her married daughter and family, and survived just long enough to give my father a vague memory of an old lady dressed in black who sat in a chair in a corner of the living room. The two old photographs above – which no-one in my immediate family had ever seen before – were sent to me by Margaret Andrews, the grand-daughter of Thomas Stops (my grandmother’s oldest brother). Margaret was carrying out genealogical research into the Stops family at around the same time as I had returned to my own investigations, and it was a serendipitous on-line ‘meeting’ that eventually led to me gratefully receiving these lost images which illuminated the unknown (and hitherto unimagined) childhood of my grandmother. This unexpected glimpse into her early life gave me an almost vertiginous feeling of falling back through a rip in time. Could it really be that I was seeing my long-dead grandmother rise up again in front me as an Edwardian child? For days afterwards I scrutinised every detail of the photographs, hoping that repeated viewings would reveal more. I became particularly obsessed with the image of the house at 95 Denmark Road. The squinty old building fascinated me almost as much as the sight of my grandmother standing at the gate. My gaze was drawn to the blinds and the net curtains at the windows; the plant on the window sill of the front room; a flower bed of what look like tulips in a tiny sad strip of garden; iron railings which were yet to be removed for a future war; a boot scraper in front of the rather forbidding-looking front door. I longed to see through the sash window on the ground floor to the room that lay behind the fussy nets. I imagined it to be dark and over-stuffed with furniture, shabby too. Perhaps a room they only used ‘for best’. And what is that shadowy object lurking just out of sight between the curtains? An aspidistra? A mahogany plant stand? Or Harriet sitting on the good chair, reading the newspaper? I thought too about the wary-looking girl who stood there, feet splayed out in front of her in a way that reminded of my grandmother in the later years of her life, lumbering flat-footed through Kew Gardens, her handbag held at her side as if it were a lump of wood. Graceful she was not! But it was hard to imagine the dumpy old lady with the dimpled arms and the long yellow teeth as this gangly pre-teen, arrested forever in a single moment in a springtime over a century ago. On that day she is standing half-way between the house and the street, poised on the cusp between girlhood and adolescence. We do not know if she is going out – perhaps to run an errand for her mother – or whether she is waiting for a friend or relative. Is she still unsure about a fatherless future on the other (wrong?) side of the river, where lodgers come and go (not realising that one day her future husband will be among them)? Is it one of her beloved brothers who is taking her picture, calling out to her as he presses the shutter? Edie, smile, will you!, laughing at his little sister’s seriousness and the way she grips the iron railing as if to stop herself from toppling backwards into a precarious past. And it is that wistfulness which seems to be reflected in her eyes in the second photograph – a studio image of a family grieving, which may seem strange to us today. Harriet is in black, looking slightly out-dated for the period, and holding something in her hands that could be a reference to her departed husband. 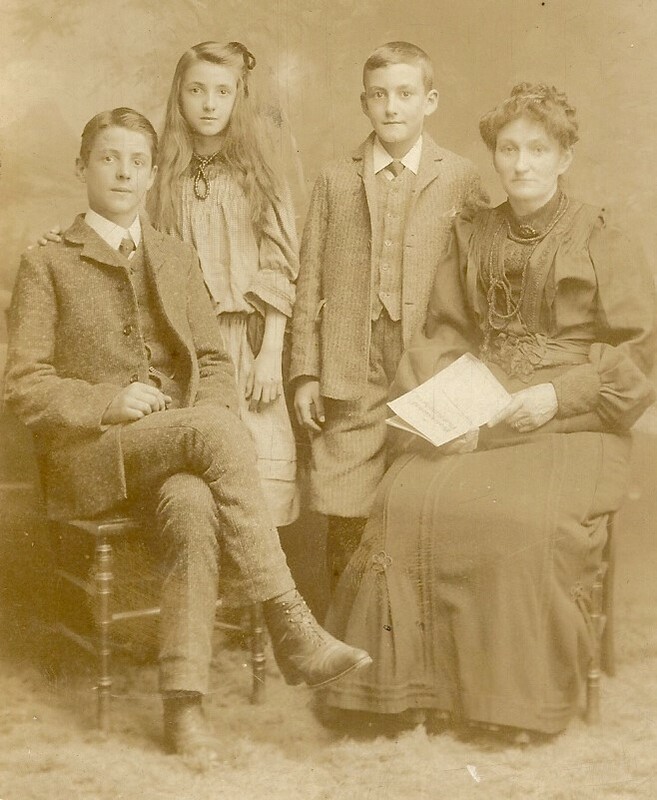 Brother Tom, in long trousers, already seems to be taking on the role of protector to his younger siblings, his expression emanating a slight air of detachment from the whole palaver associated with the rituals of the photographer’s studio. Every time I look at this photograph I am drawn to the arm that Edith has placed tentatively around her brother’s shoulders and the funny twisted necklace at her throat. I want to tell her that everything will be fine – she will keep her big brothers, despite the awful war they will fight in. This future war will even give her a chance to forge a short career as a telephonist. And later, when it is all over, she will meet a returning soldier who comes to board in the spare room at the house in Denmark Rd. Eventually she will go on to have two boys and a girl of her own with this, sometimes taciturn, man who has witnessed things of which he can never speak. And those children in turn will one day give her a brood of grandchildren to enrich her later years. 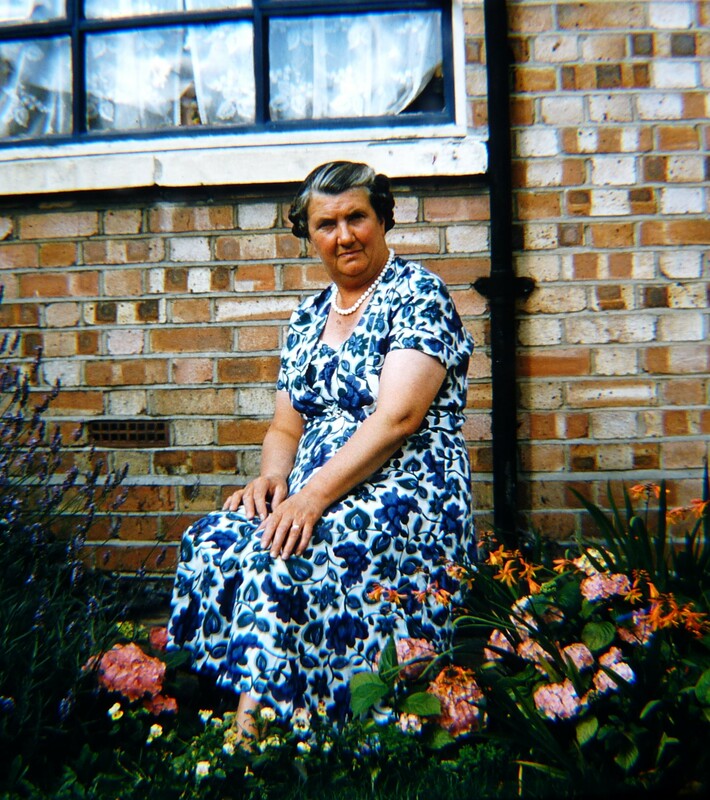 So now we see Edith (or Edie as she was known as) over 50 years later in the garden of another house – the council house in Bishops Grove, Hampton where the family moved in 1948 (after renting two rooms at the top of a house in Teddington for two years after the war ended). They were lucky, as houses were in short supply, but determined to stay near to my aunt, who had married and set up home in the area. The long years of conflict and the resulting evacuations and relocations had scattered everyone, and there were no strong familial ties in south-east London any more. In the end, my grandparents were to remain in this genteel corner of the capital, enjoying the post-war period of peace and prosperity, until their deaths in the mid-1970s. But it is only in their very last house that I really remember them – a small, ground-floor retirement flat round the corner from Bishops Grove, where they moved during their final years. When we came down from Scotland to visit them (which was relatively infrequently), it was always a disappointment to me that the house held no memories of my father’s boyhood. In contrast, our McKay grandparents’ house in Edinburgh was full of traces of our mother’s life as a young girl, and we delighted in the stories which connected our childhood to hers through a sense of place. Now I realise that part of the feeling of being disconnected from my grandparents’ past, and that of my father’s, was because we had always visited them in that neutral, ‘story-free’ space. No family events had ever taken place in those bright, modern rooms. No pre-war possessions cluttered up the flat (most having already been lost or destroyed through bombs or carelessness). Unlike the long-demolished house in Denmark Road, it was a place which did not surrender any clues to what had gone before. Merry Christmas! from The Incidental Genealogist, December 2015. This entry was posted in Houses, South London and tagged Denmark Road, Durning Road on December 1, 2015 by The Incidental Genealogist.